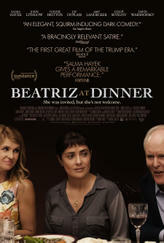 Beatriz at Dinner: Movie Clip - Did She Say Goat? This week on Indie Movie Guide Alicia reviews a very unsettling horror, a sweet film starring Sam Elliot and a Trump-era awkward dinner! Looking for movie tickets? Enter your location to see which movie theaters are playing Beatriz at Dinner near you.